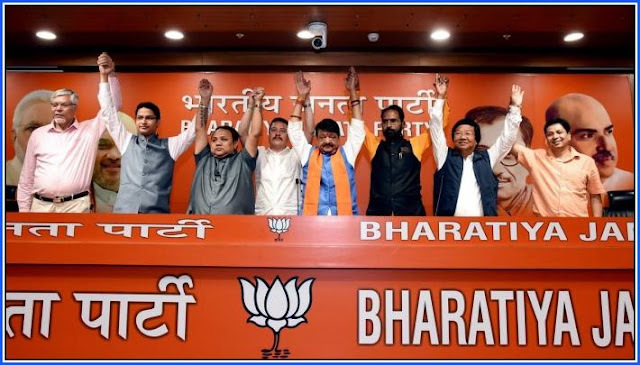 New Delhi: The Bharatiya Janata Party (BJP) is pulling out all stops in its bid to make inroads into West Bengal but it faces a stiff test in Darjeeling — one of the only two Lok Sabha seats that the party currently holds in the state. Of the 42 Lok Sabha constituencies in West Bengal, the only other place that the BJP holds power is in Asansol, represented by singer Babul Supriyo. In Darjeeling, the BJP has replaced its veteran leader and sitting MP S.S. Ahluwalia with a newcomer, Raju Singh Bisht. The Manipur-born Bisht is the managing director of Surya Roshni Limited, the makers of the Surya bulb. The BJP, though, received a shot in the arm Sunday after two of the main Gorkha outfits in the hills — the Bimal Gurung faction of the Gorkha Janmukti Morcha (GJM) and the Gorkha National Liberation Front (GNLF) — extended their support to it. Bisht, however, is up against Amar Singh Rai, the Darjeeling MLA. Rai belongs to the Binay Tamang faction of the GJM and has been fielded by the Trinamool Congress-GJM (Tamang) combine. Rai’s presence could lead to an interesting contest in this scenic constituency that the BJP won in 2014 and 2009. Darjeeling goes to the polls on 18 April. In its two victories here, the BJP had the support of the then undivided GJM and the GNLF. This time, however, the party will have to factor in the factional dynamics. Political observers say that with the Gorkha groups divided between the BJP and the Trinamool, the split in the votes will impact both parties. Even within the Gorkha factions, there have been disagreements. Soon after the GJM faction headed by Gurung extended support to the BJP, its spokesman Swaraj Thapa resigned to protest its support to “a rank outsider”. Gurung himself has been evading arrest after he was booked under the Unlawful Activities (Prevention) Act for allegedly inciting violence during the three-month-long statehood agitation that rocked Darjeeling in June 2017. Following the agitation, the GJM split, with Tamang taking over the reins of the party after removing Gurung from the post of party president. With the backing of the Trinamool government, Tamang in 2017 was appointed the chairman of the Gorkhaland Territorial Council, a semi-autonomous administrative body that runs the day-to-day affairs of the hill town. It is Tamang’s faction of the GJM that has allied with the Trinamool Congress. Bose added that a section of the Gorkha votes will also go to the CPI(M), which has fielded Saman Pathak, a Nepali local. “The Gorkha votes will be split this time. In 2014, CPI(M) had fielded a Bengali from the seat,” he said. The 2017 agitation for statehood was sparked by the decision of Mamata Banerjee’s Trinamool government to make Bengali compulsory in schools across the state. Although the state government later rescinded its order and said Bengali won’t be compulsory in the hills and in parts of Terai and Dooars, it gave a fresh impetus to the calls for a separate Gorkhaland. Since then, however, the chief minister has been wooing different communities in the hills by making them members of various boards. The Trinamool government has so far constituted 16 development and cultural boards for the different hill communities such as Gorkhas, Bhutias and Lepchas. The Congress has fielded its sitting Matigari-Naxalbari MLA Sankar Malakar from Darjeeling. “He is a local and from the plains and has a good chance of winning,” Mitra said. The BJP, on the other hand, managed to get the support of the hill groups because of what it said in its 2014 manifesto. The BJP’s West Bengal incharge Kailash Vijayvargiya Sunday said that the party fielded Bisht after Ahluwalia in a letter to party president Amit Shah expressed his inability to contest from the seat. Ahluwalia has said he can contest from any other seat in West Bengal. But political observers said that the BJP MP had become hugely unpopular in the hill town and knew that he will not win. The Bharatiya Janata Party (BJP) is pulling out all stops in its bid to make inroads into West Bengal but it faces a stiff test in Darjeeling — one of the only two Lok Sabha seats that the party currently holds in the state.